We keep having good response from our DAC web site and therefor maintain stock of hard to get components to build your own DAC. TentLabs does not offer a complete component set for a complete DAC kit. Pre production model of cabinet, not finished, no front panel but fits perfectly for this DAC. Can go for 30 euro. One of our customers, Peter Beyer, has built many of these DACs. Inspired by the Non Over Sampling principle, he has developed a Plugin for the original digital filter. Read all about it here. The components can be bought as a set (special price of €250), or separately in case you already have some of these components yourself. 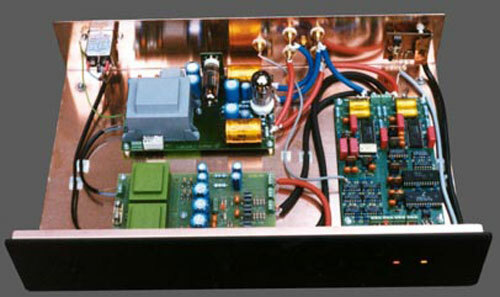 For extensions to this DAC design, have a look to the DAC upgrade pages. 1mH filter chokes for analogue filtering. Two are needed. Sold out. These chokes where selected for sonical qualities, though their brand has never been revealed as they where bought from surplus - too bad. Now select your own, and yes, you are free to suggest new brands ! Two are needed. €32.77 (€ 39.00). The plugin is fully form, fit & function compatible, using the PCM1704-J and Oscon caps for decoupling. Currently not available !! • For beads, I advice to use the BLM31AJ601SN1 from MURATA. • Remaining DAC components can easily be provided by any local supplier, therefore TentLabs cannot offer them at a competitive price level. • TentLabs does not offer a complete component set for a complete DAC kit.